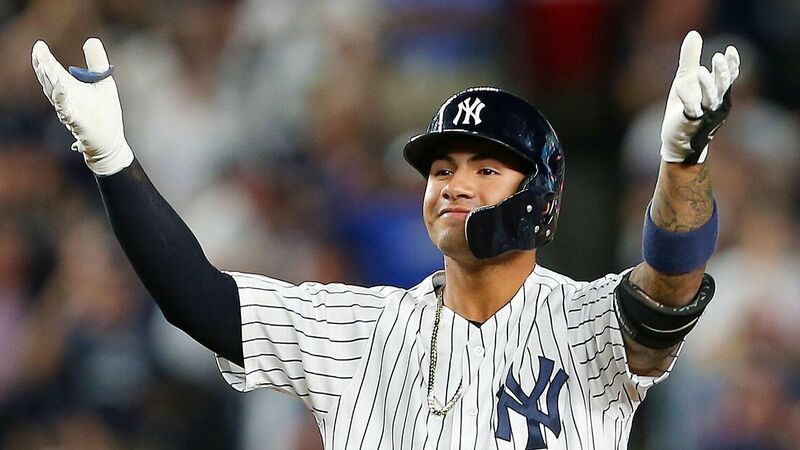 BALTIMORE — When Gleyber Torres packed up his baseball belongings Wednesday ahead of the New York Yankees‘ first two-city road trip of the season, he accidentally left something behind — his batting gloves. Since he still needed a pair to hit with when the Yankees opened their series against the Baltimore Orioles at Camden Yards on Thursday, New York’s equipment staff reached into its cache of extra game-day items. Maybe that’s where the 22-year-old’s extra power came from. Handed a pair of former Yankee Alex Rodriguez’s No. 13 batting gloves, Torres went on a hitting tear Thursday, cranking out four hits, slugging two home runs, stamping his name next to Joe DiMaggio’s and leading the depleted Bronx Bombers to a much-needed early-season win. It was Torres’ sixth-inning three-run homer that propelled the Yankees to a lead they wouldn’t relinquish in the eventual 8-4 win. The victory snapped a two-game losing skid, improving New York’s early record to 3-4, allowing one injury-plagued, drama-filled week to end on a high note. Earlier in the week, the Yankees sent three key players to the injured list due to various ailments. Miguel Andujar (small labrum tear) and Giancarlo Stanton (left biceps strain) were shut down on the same day. Mere hours before Torres’ 4-for-4 showcase, Troy Tulowitzki (left calf strain) was added to the IL, too. There are a league-leading 11 total players on the Yankees’ injured list. It took little time for Torres to focus in Baltimore’s home opener. During his first at-bat leading off the third inning, the shortstop turned on a 1-1 splitter from Orioles starter Alex Cobb, depositing it well over the left-field wall. After drilling a double down the right-field line, against an infield defensive shift set up against him, Torres homered for a second time in his sixth-inning at-bat. That one came off Mike Wright, marking the second time in the young, two-year player’s career that he had homered off Cobb and Wright in the same game. To cap his four-hit day, Torres singled in the eighth. “He can use the whole field and can use it with power,” Judge said. “Especially a guy that plays second or shortstop, for him to come up and he’ll hit homers to left field and all of a sudden he’s spraying doubles down the right-field line, it’s just impressive what he can do at such a young age. The last time Torres homered off Cobb and Wright in the same game — Aug. 1, 2018 — was the last time he had registered a multihomer game. The youngest Yankee with four hits and three extra-base hits in a game since DiMaggio did it June 28, 1936. One of two Yankees shortstops to ever have four hits, including two homers, in a road game. Derek Jeter accomplished the same feat May 8, 2011. The youngest Yankee to go 4-for-4 or better in a game since Jeter did it July 2, 1996, against Boston at 22 years, 6 days old. The fourth-youngest Yankee to have four hits and four RBIs in a game since the RBI became an official stat in 1920. Torres was 22 years, 112 days old Thursday. Only DiMaggio, Mickey Mantle and Lou Gehrig were younger when they had four-hit, four-RBI games in team history. Of Torres’ 26 career home runs the past two seasons, 13 have either given the Yankees a lead or tied the game. Torres said one of the reasons he has had so much success in the clutch is that his focus remains the exact same at-bat to at-bat. As for A-Rod’s batting gloves, look for them when the Yankees play the O’s again Saturday. Torres said that while his customary gloves likely will be shipped to Baltimore by then, he won’t be wearing them. He isn’t planning to give up the lucky No. 13s anytime soon. And after a day like this, why would he?